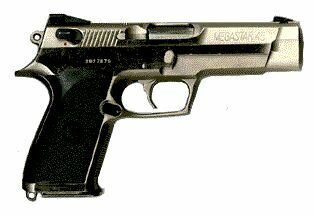 The Megastar is a large, steel framed pistol, identical in operation to the M31, but carrying 12 .45 ACP cal. or 14 10 mm Auto cartridges. Though innovative at the time of its introduction, there are now a number of high-capacity large-bore weapons, and there were apparently no large sales. It is no longer in production. The gun also has a drop safety that blocks the firing pin from moving unless the trigger has been pulled. Detail stripping is also somewhat different in that the rear sight is retained by the firing pin stop plate and is removed to the rear, instead of being dovetailed in. Use caution, as it holds the plunger for the drop safety which can fly out and be lost. The stripping pin is separate from the slide lock lever, and is retained in the frame when the gun is field stripped. It pushed out left to right, opposite the way of the Firestars, M28 series and older pistols. It should be noted that Interarms, when importing the 10 mm pistols to the US, usually welded a strip of steel to the inside of the magazine tube, inexplicably limiting the capacity to 12 shots. Though reliability may be compromised, .45 caliber magazines appear to work in 10 mm guns, and do yield the full capacity.